That’s what a lot of people tell me when they find out I’m vegan. I used to feel the same way. Today, cheese has a different connotation for me and I not only don’t miss it, I loathe it. For 18 years I was a vegetarian. If people asked me if I ate cheese and drank milk I answered, “yes, because the cows don’t get killed.” I was ignorant and completely clueless to reality. I wish someone had told me the truth. Just like a human female, cows don’t “give milk” until after they have a baby. And the dairy corporation can’t have all those babies drinking their profits. That milk is for people! In order to keep milk in production, cows are kept pregnant. Cows don’t give us their milk. We take it away from them. Just like we take away their babies. Normally a calf nurses for up to a year, but usually within a day, calves are either killed or auctioned off for veal (if they’re “useless” males), or separated into pens where they can grow up into milk producers to replace their mothers. After four or so years of constantly being pregnant and lactating, a cow’s milk production goes down. She isn’t profitable anymore. She is “spent.” Dairy cows are auctioned off and turned into cheap, ground beef. They’re normal lifespans are closer to 20 years. Milk will turn a small calf into a 1000-pound cow. It does the job well, but I don’t want to grow that big. I don’t want to drink hormones and antibiotics. I don’t want to fuel disease. Milk has too much protein, and we excrete the excess–along with calcium from our bones! It taxes our kidneys, and increases our risk of osteoporosis, diabetes, cancer, heart attack and stroke. I get calcium just like cows do: from dark leafy greens. Milk doesn’t have fiber, but it is full of cholesterol and fat. Who needs it (well, besides cows)? “Spent” dairy cows end up as hamburgers. I wouldn’t drink milk from a dog or a monkey so why drink milk from a cow? After infancy, no other animal even drinks milk at all–not even from their own species! So next time you think about life without dairy, think about the animals who suffer for our taste buds. With a plethora of dairy-free alternatives, you won’t miss milk. 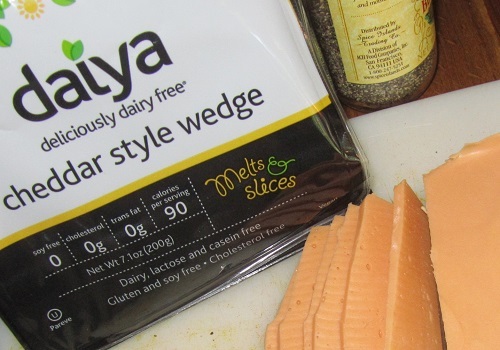 We have choices like dark chocolate, coconut yogurt, hemp, oat, soy, almond and rice milk, non-dairy creamer, sorbet and soy or coconut ice cream, and delicious vegan cheeses from companies like Daiya and Tofutti. Dump dairy and ditch cruelty! This entry was posted in animal rights, cruelty-free, vegan food, veganism and tagged animal rights, cheese, dairy, milk, veal, vegan, vegan cheese, vegan food, veganism, vegetarian. Bookmark the permalink. Wow! that’s a powerful post, Celeste. I don’t know how I missed that on your site. I love the angle you took and that you linked to Farm Sanctuary. My images link to their site, and I encourage my readers to read your post! Thanks for sharing. Celeste: I shared the link….at the risk, I’m sure, of offending some of my friends and family. Giving up cheese, yogurt and ice cream was the hardest. Now, not only do I not miss it but the thought actually disgusts me! Cow’s milk is for calves. Like you said, we wouldn’t drink milk from a dog or monkey, drinking cow’s milk is now equally weird since I replaced it with healthier and better food. I’ve read Celeste’s posts–they are very good!! As more and more people find out the truth about the cruelty of the dairy industry and learn the facts that cow’s milk is not healthy or beneficial for humans, we will all be better off–and so will the animals! It is hard at first. We’re creatures of habit and our taste buds are stubborn! But I’ve found so many dairy-free alternatives that it’s actually easy once you try. I’m glad you persisted and didn’t give into your cravings. The lives of animals are more important than a measly meal. I appreciate your compassion! Carmen and Celeste you both raise the same important point: cheese is addictive! People laugh when they say they crave it, but they actually are addicted. Dairy contains casomorphins meant to bond mother and calf. The same thing that keeps the calf coming back for more milk is the same thing that keeps us addicted to it! Scary! Fortunately, in time, the desire passes, as both of you noted. Hi! I love this post (obviously more people need to know about this; I’ve had the “what’s wrong with dairy” question asked about a thousand times!) and thanks for linking to me. Your blog is great! I’m glad you like the post! I didn’t even question the problems with dairy when I was a vegetarian so I guess it’s good people ask us. But sometimes, when I tell them, they look at me like I’m crazy. I’m not making this up! Thanks for visiting. I’m always happy to find other vegan fashionistas and I enjoy your blog. I still haven’t found a way to combine fashion with “heavier” animal issues so for now, I have two blogs. I know someone that is vegetarian for the animals but still eats cheese because it doesn’t involve killing animals. Ugh. I can’t live without cheese either…but guess what! I don’t have to because vegan cheeses are awesome and cruelty free just as you mention. Wonderful post!! So true! There are so many dairy-free options. We definitely don’t deprive ourselves 🙂 Luckily no one has to suffer and die for a tasty meal. Thanks for commenting. I love connecting with compassionate people! What a thoughtful provocative read……at the risk, I’m sure, of offending family and friends, I have shared this blog and Celeste’s “Honk……./Julia’s story” on my timeline…..I hope I don’t get clobbered (verbally). Thanks for sharing Bob. It might not be something people want to hear, but knowledge is power! I prefer to know the truth and make informed decisions. I appreciate you reading my blog 🙂 Great to have your support. I recently enjoyed a vegan pizza.